Copies of documents have been added at bottom. So, what kind of leverage does the Empire State Development Corporation (ESDC) have to get the Atlantic Yards project completed in a decade, as promised in the 2009 Modified General Project Plan and defended in a court hearing last week and in legal documents? And while the developer is still supposed to build the promised 2250 units of affordable housing, an Affordable Housing Subsidy Unavailability can be claimed (added: for up to eight one-year periods), thus continuing to stretch the deadlines. Note that the timetable clock does not start until property is delivered via eminent domain. The documents support the wide belief, even among project proponents and state officials, that the project could not be built at the promised timetable. Last April, Marisa Lago, then-CEO of the ESDC, said that the project would take "decades." What they apparently fail to apprehend in painting their dismal picture of the future course of the Project is that there will be an entirely separate set of agreements between FCRC and ESDC, and that under those agreements FCRC will be contractually committed to implementing the 2009 MGPP. (Fact Statement 39.) Among other things, FCRC will be required to use "commercially reasonable efforts" to complete the Arena and certain Phase 1 buildings in accordance with a specified schedule, and to bring the Project to completion by 2019, with sanctions imposed for any failure to do so. Now those separate agreements have surfaced, as part of the Atlantic Yards master closing documents, first made available Monday. Despite claims in the development agreement that the damages were negotiated at arm's length, there's reason to believe that the relationship between the developer and the ESDC is rather more cozy, especially given the relatively light damages. The documents are maddeningly complex, written in legalese with Rube Goldberg-ian formulas, and multiple documents address some of the same issues. So it's certainly possible that some of my analysis is flawed. However, given the absence of any official statement of damages and sanctions, consider this a good first pass. The Effective Date means the date on which all litigation has been concluded to permit financing and construction to proceed, as originally stated. There's another requirement: it's also the earlier of two dates: when ESDC delivers vacant possession of the Phase 1 Properties to the developer, or the date on which the developer tells the ESDC that it is waiving the requirement that ESDC deliver possession of such properties. In other words, the Effective Date hasn't yet arrived, though it may come soon. A hearing on condemnation is scheduled for January 29, but some property owners and renters are expected to challenge the taking. So, what are the damages payable to the state? They're much greater if the arena doesn't get started, but they're quite light if the arena doesn't open within six years. If arena construction doesn’t start before Outside Arena Commencement Date, which is one year after the Effective Date, Brooklyn Arena LLC (BALLC) would pay $75 million to the state. However, this deadline can be extended for Unavoidable Delay, the failure to deliver property via eminent domain, and the failure to "obtain financing... on then commercially reasonable terms," though this date can't be extended beyond the fifth anniversary of the Effective Date. If the arena is not substantially completed on time, meaning the sixth anniversary of the Effective Date (subject to Unavoidable Delay), BALLC would either have to pay the $75 million (if construction didn't begin on time) or a schedule of liquidated damages exactly the same as those payable to the city, indicated below. An Arena Multiplier would increase annually: 2%, 3%, 4%, 6%, 7%, 8%, 16%, 17%, 18%, and 19%. This sum would be applied to damages set forth in Column B of Schedule A. The Year is calculated from the date city and state funding began: 2007 (I believe) for the city and 2008 for the state. So, if arena construction were to begin in 2010 and not be completed in 2016, the damages would start in 2016 at 2% of a sum in Column B, applied to $115 million, the figure regarding Years 7-9, the elapsed time since city and state funding begins. Bottom line: 2% of $115 million = $2.3 million. Apply that sum to both city and state damages, that's $4.6 million for an arena that doesn't open by 2016. Delay the arena another year, and the damages are 3% of that $115 million, or $3.45 million to both city and state, or $7.9 million. Add another year, and the damages are 4% of that $115 million, or $4.6 million to both city and state, or $9.2 million total for an arena that opens in 2019. The developer has 12 years to build 1.5 million square feet of Phase 1, excluding the arena, "subject to Unavoidable Delay" as well as "Affordable Housing Subsidy Unavailability" and "Market Financing Availability." That 1.5 million square feet in Phase 1 was set as a minimum in the City Funding Agreement signed in September 2007 which surfaced in April 2008. It represents likely three towers, or maybe four, rather than the five in the project design. Conspicuously omitted is an office tower for which there's no market, though the second and third buildings are described as "flexible," which presumably allows for office space. It is some 44% smaller than the 2.69 million square feet “expected” in the General Project Plan approved by the ESDC in December 2006. The 2009 Modified General Project Plan (MGPP) approved by the ESDC in September 2009 includes similar language, though both have wiggle room, mentioning "up to 2.1 million gsf of residential use." All the project benefits, of course, have been premised on the full buildout. According to the latter MGPP, Phase I would mix rental and condominium housing, with approximately 1,005 to 2,110 residential units, with 30% of the units on the Arena Block (but no less than 300 units) affordable. Construction of the first tower must occur within three years of the Project Effective Date, "except in the event of a City Excuse," which is defined as the denial of housing subsidies and which would add one year. That starting date--three or four years after delivery of Phase 1 property by eminent domain--is known as the First Commencement Deadline. The affordable housing in the first tower (but not the others) would have to conform to one of six possible scenarios--which include several scenarios with no low-income units. If the building has not begun on time--subject of course to the major caveats noted above--the developer would have to pay the "3-4 Year Liquidated Damages" by the First Commencement Deadline. What's the payment? $5 million, paid monthly over a year, with the amount $100,000 in each of the first two months and escalating to $1 million in each of the last two months. The second tower would have to begin construction no later than the second anniversary of the First Commencement Deadline--or five to six years after property is delivered via eminent domain. That new date would be known as the Second Commencement Deadline. The same $5 million penalty would apply. As for the third tower, it would have to begin construction no later than the second anniversary of the Second Commencement Deadline, or seven to eight years after property is delivered via eminent domain and the tenth anniversary of the Effective Date. The same $5 million penalty would apply. The Affordable Housing Subsidy Unavailability lasts for a year, and must be substantiated again one year later. To the extent that the developer substantiates. a Market Financing Unavailability, the deadline could be extended on a month-to-month basis as long as the developer substantiates the continuation of a Market Financing Unavailability. Consider that the Urban Room would be attached to an office building for which there is no current market, or a reasonably foreseeable one. But a $10 million or even $20 million penalty would be relatively modest, again compared to the $31 million recently advanced to the developer for land purchases. There's no state penalty for delays in Phase 2 other than the possibility of property being taken away from the developer. There are no city damages for a delay in Phase 2--perhaps because most city funding is aimed at arena land and infrastructure. The developer or affiliates must complete at least 2,970,000 square feet of development for Phase 2, including a school (if applicable), a day care center, no less than eight acres of open space, and the Platform, within 25 years following the Project Effective Date, subject to Unavoidable Delays. And what are such delays? The continuation of an Affordable Housing Subsidy Unavailability. Note that the total square footage of Phase 1 and Phase 2--less than 4.5 million square feet, plus an arena that would be 675,000 square feet--would be far less than the 7.9 million square feet initially approved and, as noted, the basis for analysis of benefits such as tax revenues and jobs. ESDC or its designee shall have the right to terminate (the "Termination Option") the applicable Project Lease as to any portion of the Project Site which construction of Improvements has not commenced in accordance with this Agreement and the Applicable Project Lease as of the date the Terminal Option Notice is given by ESDC (the "Unimproved Parcels"). The Termination Option will be exercised by ESDC in according with Section 17.5. (a) If ESDC elects to exercise the Termination Option, ESDC may deliver a revocable written notice (“Termination Option Notice”) to AYDC, Interim Developer and each Tenant under a Project Lease, as applicable, within two (2) years following the Event of Default giving rise to the Termination Option. ESDC may exercise the Termination Option with respect to all or a portion of the Unimproved Parcels, and any partial exercise shall not waive or otherwise invalidate ESDC’s right to exercise the Termination Option with respect to any remaining Unimproved Parcels. In the event ESDC does not deliver a Termination Option Notice with respect to all or any Unimproved Parcels within such two (2) year period, the term of the Project lease demising such Unimproved Parcels shall be extended for an additional five (5) years. Within one (1) year following the expiration of such five (5) year period, ESDC shall again have the right to deliver a Termination Option Notice with respect to any then Unimproved Parcels. The preceding cycle of five (5) year extension terms of Project Leases and one (1) year periods for ESDC to deliver a Termination Option notice shall continue until the earlier of (i) the commencement of Development Work on all Unimproved Parcels pursuant and subject to the terms and conditions of one or more Development leases or (ii) the occurrence of a Conveyance Date with respect to any remaining Unimproved Parcels. The developer must begin construction of the platform over the railyard no later than the 15th anniversary of the project Effective Date, "subject to Unavoidable Delays," which include infrastructure failures, inability to procure labor, equipment, materials or supplies (but not customary delays), which are not attributable to improper acts or omissions by the developer--or any litigation. Unavoidable Delay does not include failure to obtain financing or mortgages--except in the case of clauses relating to housing, where it does include failure to obtain financing. However, no penalty is assigned for the delay--or, at least, none that I could find. In terms of city damages for a Phase 1 delayed more than 12 years, the annual Phase 1 Base Multiplier--2% for the first year, then 3%, 4%, 6%, 7%, 8%, 16%, 17%, 18%, and 19%--applies to Column C at right. That's a much smaller penalty than for a delayed arena. 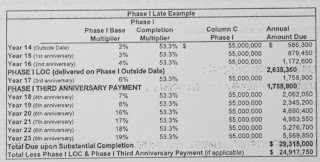 Remember, the Year calculation applies to when city funding begins, so the penalty for a late Phase 1 likely would be applied to the sum in Column C associated with Years 13-15. However, that $55 million would be modified by not one but two percentages. According to the Rube Goldberg-ian formula, the one year delay--to which 2% is attributed--would then be modified by a percentage associated with the total amount of square footage less than the required 1.5 million square feet. So, in the example at left, 1.1 million square feet has been completed by Year 14, and the completion multiplier is 53.3%, which is calculated by the excess of 1,100,000 divided by 750,000. As noted, the first year penalty would be under $600,000. The developer would have to deliver a Phase 1 LOC (Letter of Credit) equal to three years of Liquidated Damages. That adds up to a little more than $2.6 million in penalties that would kick in after three years of penalties. That date would be 15 years after Phase 1 construction began and would be Year 16 (at least) after city funding began. And what if Forest City Ratner abandons the project? 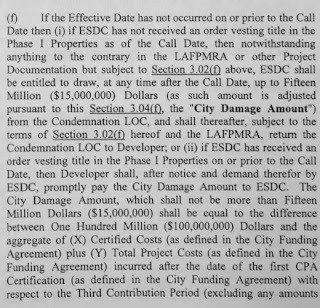 Well, the City Funding Agreement states that, if the project is abandoned or terminated before the Arena Outside Date, the ESDC would repay the Disbursements, up to the $131 million total, to NYCEDC, plus Liquidated Damages. Depending on the date of abandonment, the Liquidated Damages could be modest. For example, if the project were abandoned within six years of the first city disbursement, the Liquidated damages would be $29 million. That sum would jump to $54 million if the abandonment came seven to nine years after the first disbursement. 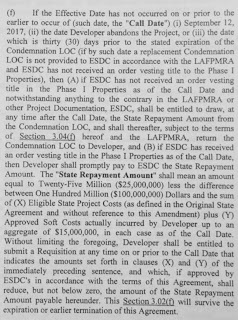 The amended State Funding Agreement now sets up a Call Date, whichever is earlier: September 12, 2017, or the date Developer abandons the Project, or 30 days prior to the state expiration of the Condemnation Letter of Credit (LOC), which covers "the cost of acquiring a portion of the Project Site." Then, if ESDC has not received an order vesting title in the Phase I properties, it can draw the State Repayment Amount from the Condemnation LOC, and if ESDC has received an order vesting title in the Phase I Properties as of the Call Date, then Developer shall promptly pay to ESDC the State Repayment Amount. What's the State Repayment Amount? It's equal to $25 million less the difference between $100 million and the sum of (X) Eligible State Project Costs plus (Y) Approved Soft Costs actually incurred by developer up to an aggregate of $15 million, in each case as of the Call Date. So if Eligible State Project costs and Approved Soft Costs add up to $90 million, that sum would be subtracted from $100 million, leaving $10 million to thus be subtracted from $25 million. And the developer would owe just $15 million. A similar sum might be owed to the ESDC as the City Damage Amount. If the Effective Date has not occurred on or prior to the Call Date and if ESDC has not received an order vesting title in the Phase 1 properties by that time, ESDC shall be entitled to draw up to $15 million (the City Damage Amount) from the Condemnation LOC. If ESDC has received an order vesting title in the Phase 1 properties, on or prior to the Call Date, then Developer shall, after notice and demand therefore by ESDC, pay the City Damage Amount to ESDC. The City Damage Amount would not be more than $15 million; it would be equal to the difference between $100 million and the aggregate of Certified Costs (as defined in the City Funding Agreement) plus Total Project Costs. The 25-year build out schedule is flat out unlawful. The NY Eminent Domain Procedure Law, section 406, provides that any condemned property not "materially improved" must be offered back to the former owner after TEN YEARS. The legislative history of the EDPL shows a great concern to avoid "condemnation blight" (e.g. decades of parking lots). ESDC has no authority to authorize a 25-year project based on eminent domain. Senator Perkins: It is clear that ESDC is a lawless agency in desperate need of legal oversight. ESDC's representations in court that AYP is not a 25-year project were perjurious and intended to deceive the court. Lawyers should be disbarred for making such false sworn statements. No doubt, they will receive a bonus for their cleverness.